Visiting the Arizona Memorial, one of the top free things to do in Hawaii. Hawaii is a place where there is certainly a lot of things to do and see. But many may not know that some of the Hawaii top attractions can be visited at no cost. Here are some of the top free things to do in Hawaii. 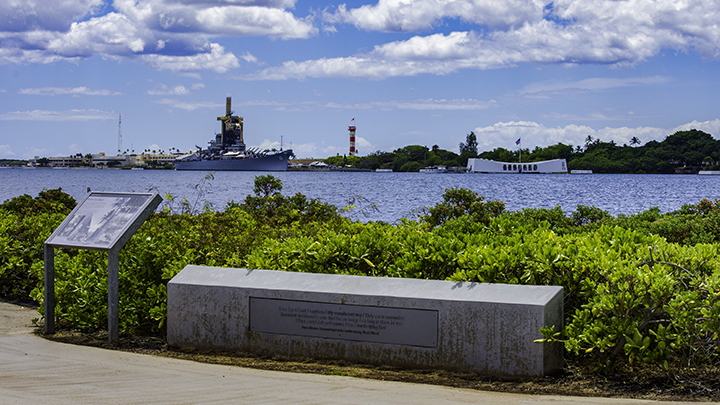 The USS Arizona Memorial is a part of the multi-state World War II Valor in the Pacific National Monument. The National Park Service manages the memorial. This is Hawaii’s top tourist attraction and chronicles the events during the December 7, 1941 attack on Pearl Harbor. It’s also one of the top free things to do in Hawaii. The memorial tells about the heroism and sacrifices of those who fought in the Pacific during World War II. There is no charge to enter the two museums and to take the boat ride to the memorial. Here, you can see the sunken hull of the USS Arizona, the grave site for over 1,100 sailors and marines. However, there are only 1,300 tickets available each day for the boat ride to the memorial. You can find the memorial off Ford Island in Pearl Harbor. Tickets are given out starting at 7:00 am daily. All persons in your group must be present at the counter to receive tickets. You can also reserve your ticket up to 60 days in advance online at www.recreation.gov. But there will be a non-refundable $1.50 convenience fee for each ticket. Punchbowl, National Memorial Cemetery of the Pacific. Many refer to the National Memorial Cemetery of the Pacific on Oahu as Punchbowl. It is another one of the top free things to do in Hawaii. There is no charge to enter the memorial cemetery in the heart of Honolulu. The Department of Veteran Affairs manages the facility. The national cemetery was initially completed in 1949. It was the burial site for deceased servicemen whose bodies were temporarily stored throughout the Pacific Basin. Today, the cemetery is the final resting place for over 53,000 servicemen and women. It includes the famous World War II correspondent Ernie Pyle, in addition to numerous Medal of Honor recipients. The national cemetery is a solemn, yet beautiful place to visit. 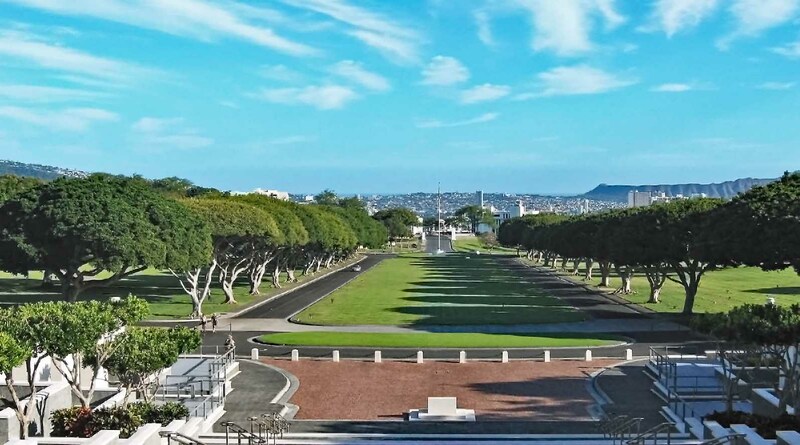 The memorial features artwork depicting the battles that America has fought in the Pacific as well as offers some of the best panoramic views of Hawaii’s largest and capital city, Honolulu. View Along the Hana Highway. 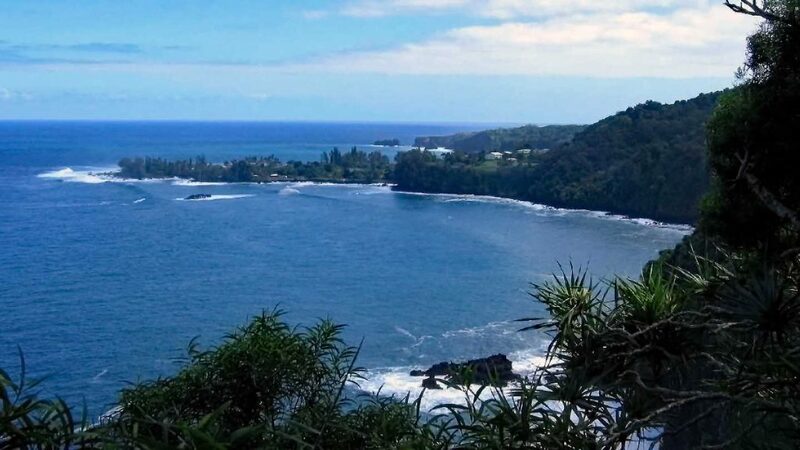 There is probably no more famous and scenic drive in Hawaii than the road to Hana on Maui. It is certainly one of the top free things to do in Hawaii. The 64 mile winding road features 620 curves and 59 bridges. The road passes verdant forests, numerous seaside coves and many picturesque waterfalls. Here, you can stop along the rustic town of Hana with its nearby seaside caves and anchialine pools. Anchialine pools are landlocked bodies of water where fresh and sea water converge together. Past Hana, you can visit the grave site of the famous aviator, Charles Lindbergh, in Kipahulu. While the drive itself is not that long, the one-way drive could take 3 hours because of its narrow and winding nature. The highway was designated as the Hana Millennium Legacy Trail in August 2000 as well as listed on the National Register of Historic Places on June 2001. 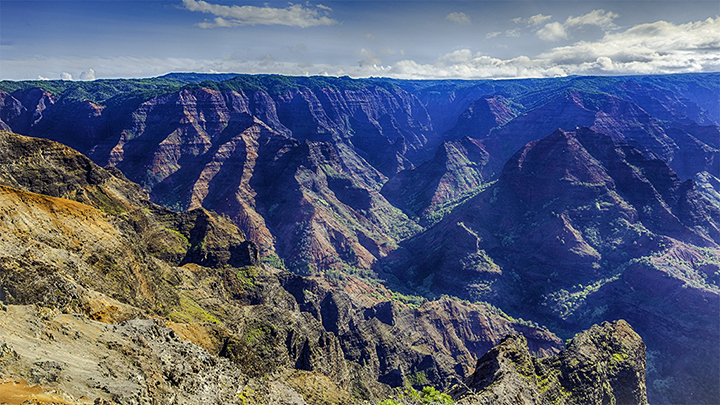 Many call Waimea Canyon the “Grand Canyon of the Pacific” for good reason. The canyon has multi colored geologic features of green, red and brown hues. The erosive flow of the Waimea Stream created the canyon over a million years. These features lend themselves to comparisons of the Grand Canyon in Arizona. Along the 18 mile State Road 550 on the western side of Kauai, there are 4 major lookouts to view and take pictures of the picturesque canyon. Along these lookouts, you can also get a commanding view of the remote neighbor island of Niihau. Waimea Canyon is a part of the Hawaii State Parks system, which does not charge a fee to enter this park. Some of the Big Island’s most popular attractions are its National Historical Parks. 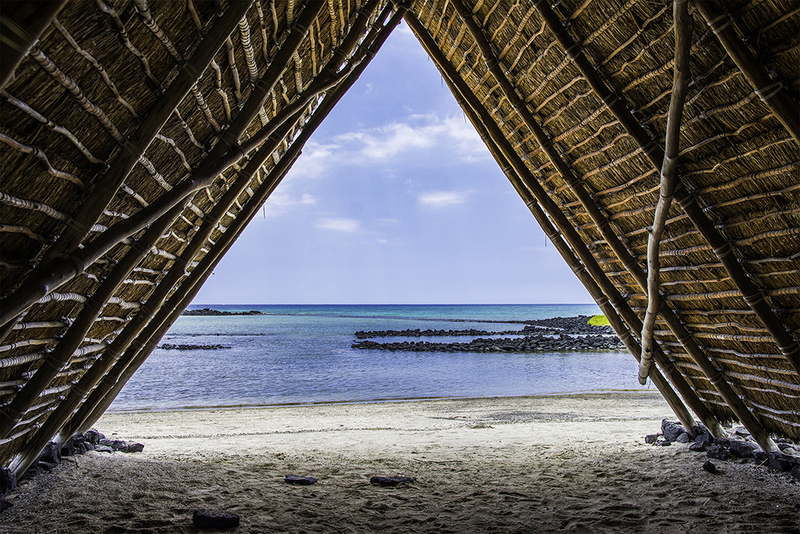 You can visit two without charge, the Kaloko-Honokohau and the Pu’ukohala Heiau parks. The National Park Service manages these two parks, which interpret key aspects of Hawaii culture and history. King Kamehameha I built the Pu’ulohala Heiau as a place of worship around 1790. He dedicated it to the war god Kūka’ilimoku. According to legend, building a heiau would fulfill a prophecy for unifying all of the Hawaiian Islands under his rule. The prophecy became true when he ultimately became ruler of all of the Hawaiian Islands. The Kaloko-Honokohau National Historical Park preserves the traditions and culture of an ancient Hawaiian settlement. It contains the partitions of a Hawaiian ahupua’a which are land divisions extending from the mountain to the ocean. Here, you can also find ancient Hawaiian petroglyphs, stone housing platforms, fishpond and heiau. Why Should You Visit Hawaii?